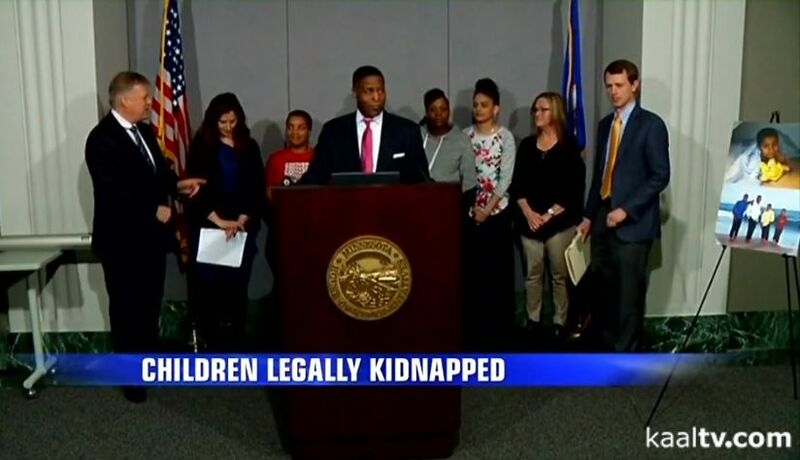 The lead plaintiff in the lawsuit is Dwight D. Mitchell, who founded an association of parents called Stop Child Protection Services From Legally Kidnapping, which has about 250 members in Minnesota. Mr. Mitchell and several parents held a press conference at the State Capital last week, and Mr. Mitchell was interviewed by several local media sources. Mr. Mitchell explains how he had his three children removed from his home because a family babysitter reported him to CPS for a “bottom spanking” with one of his children. It took him almost 2 years to get his son back home. “Every night, I went to sleep not knowing where he was,” Mitchell said, describing the experience as traumatic and comparing it to a legal kidnapping. Mitchell’s lawsuit claims Minnesota laws regarding corporal punishment by parents, such as spanking, are unconstitutionally vague. Child protection can investigate parents for any action that causes pain or mental injury. Mitchell says state and county officials enforce that and other child-protection laws inconsistently and black families are considerably more likely to end up in the system and lose custody of their children. State data show black children are three times more likely to be involved in the child-protection system and be taken from their parents. Black parents also are more likely to lose their parental rights than their white neighbors. The disparity is even higher for multi-racial and American Indian children and their families. Richard Wexler, the executive director of the National Coalition for Child Protection Reform, wrote an op-ed piece for MINNPOST earlier this month on why Minnesota’s approach to child protection makes children less safe.